Our Recommendation is for YOU to make the $$$$ MONEY – Some activities are High Turnover Money makers whilst others work as an attraction to hold people and provide a Unique Memorable Experience. Kiwi Rock Climbing provides a wide range of fantastic Activities to hold, entertain & build self esteem for both kids & adults, bringing together families and communities …we Deliver ON TIME – EVERYTIME. 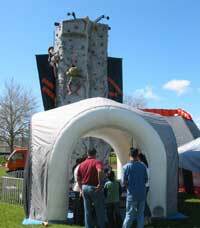 Kiwi Rock Climbing Does it all from Full Event Planning to just providing an Activity with Full OSH Policies and uniformed, trained professional Staff …we will make the difference. If you would like to have a Kiwi Rock Climbing Activity as part of your fundraising event, please Contact Us and we will workout what we can help you achieve. 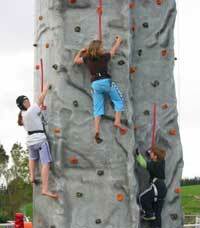 The Kiwi Rock Climbing Difference….. SETUP – ON Time – EVERYTIME !!! UNIQUE INFLATABLE Activities that everyone enjoys …..
Pirate Adventure – Climb aboard into a large bounce and play area with Poop deck – Climb & Slide . Scooby Doo Adventure – Enter to Bounce & Slam dunk then chase your friends thru the challenges. Bouncy Units – Interactive Jump and Bounce 4x5m units Well designed with Bash & Tackle Tubes. 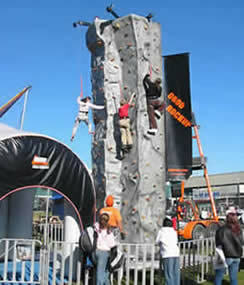 ROCKCLIMBING – the Ultimate in Attraction Value & REAL FUN these $100,000 units are the best !!! Archery – 4 Stand – A great way to improve skills and make Money $$$$ Shoot the Apple ! 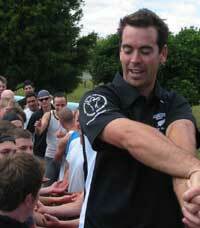 Tug O War – A Real TEAM Favourite – PULL to WIN!!! Ski Boards – Step together to WIN !!! Huge Rubic Cubes – Solve the Puzzle to WIN!!! Chair O Planes, Merry Go Rounds, Mechanical Bulls, Mechanical Surfboards and lots more !!! Sponsored programs provide low cost EOTC Activities & programs to the schools to create HUGE ONGOING EXPOSURE with banners, signage & branded prizes to drive sales in a multifaceted way that Generates Growth & Goodwill to an open audience of market place drivers… past present & future.